The most comprehensive training and compliance system in aviation. Pelesys’ TMDS is a state-of-the-art SaaS (Software as a Service) system, which is scalable and flexible for any airline or training operation. A tailored system configuration will be created based on each organization’s requirements and needs. The solution supports industry standard desktop and mobile platforms, online and offline. Managing all aspects of training is the strength of Pelesys’ TMDS solution. From qualifications, notifications, curriculum / content development and deployment, classroom and simulator scheduling, electronic grading and data collection, examinations, assessments, and reporting. Pelesys’ TMDS enables an organization to schedule and deliver their training efficiently while managing and ensuring regulatory compliance, reducing operating costs and introducing automation to existing work processes. Pelesys’ Training Management and Deployment System (TMDS) encompasses scheduling, learning management, learning content management modules, examinations, qualifications management, and electronic training records and grading. The TMDS solution is a state-of-the-art SaaS (Software as a Service) system, which is scalable and flexible for any airline or training operation. A tailored system configuration will be created based on each organization’s requirements and needs. The solution supports industry standard desktop and mobile platforms, online and offline. TMDS manages all aspects of training from qualifications, notifications, curriculum / content development and deployment, classroom and simulator scheduling, electronic grading and reporting. It enables an organization to schedule and deliver their training efficiently while ensuring regulatory compliance, reducing operating costs and introducing automation to existing work processes. The Learning Management System (LMS) organizes, launches and tracks e-learning content. It allows an organization to effectively manage user records, enrollments and learning status records to improve operational and training efficiency. The LMS is compliant with AICC and SCORM standards, and supports industry standard desktop and mobile platforms. Pelesys LMS also supports mobile training with Pelesys Crewpad. Many supported courseware/file formats (AICC, SCORM 1.2/2004, PDF, media, MS Office). Fully customizable courses (lessons, exams, prerequisites, completion requirements). Batch enrollment creation, management and reporting. Students can learn online (web-based) or offline (iOS CrewPad app, PC CrewKey app). Automated notification and enrollment modules. Pelesys’ Crewpad deploys WBT courseware and document materials to flight crew, cabin crew and other airline personnel; distributing all types of training content and media to mobile devices for off-line training. Crewpad manages the distribution and synchronization of information to end users on a regular basis. Flexible online / offline record synchronization allows the user to take the same course(s) online over the Internet as well as offline from an iPad, USB, PC or Mac computer. The Electronic Training Records solution (ETR) and Mobile Assessment tool allows you to create and manage any type of task analysis or assessment criteria, then generate electronic grade forms and assessments that can be completed online or offline. Completed assessments are stored securely, so that collected data can be analyzed and reported on. With the ETR solution you are able to extract precise statistical evidence to adjust and fine tune your training programs and improve your instructor standardization. The ETR solution enables you to streamline your training data management process, efficiently manage your AQP / ATQP or other EBT (Evidence Based Training) programs and reduce your overall training management costs. Traditional assessments such as Line Checks, CRM Forms, Type Rating Assessments and Proficiency Checks can be easily managed and delivered using ETR. *The ETR System is provided in partnership with Logitude Ltd. The Qualification Management System (QMS) that is used to monitor, aggregate, and maintain employee qualifications. QMS is a rule based solution that will automate the management process to track all your qualification requirements for flight crews, maintenance engineering, dispatchers, ramp employees or any other business unit that requires qualification monitoring for regulatory compliance management. The QMS is an invaluable aid for employers seeking to streamline their qualification process and ensure that employee qualifications remain current. Highly customizable certification and qualification rules. LMS integrated (automated certificates completion and enrollment creation). Certificate completion can be based on skills/training form submittal. Detailed reports and gap analysis. Digital storage and creation of customizable PDF-based certificates. The Exam Generation System (EGS) is a web-based question management and exam generation tool that provides a centralized platform to manage question databases and create electronic exams, quizzes, assessments and surveys. Exam structures can be created that meet examination requirements, such as random question generation, random question order, random distracters, time limitation, re-entry restriction, mastery scoring and will meet regulatory authorities examination and System Knowledge Validation (SKV) requirements including traning remediation criteria for an individual or classroom. Fully integrated with the LMS (export exams as newly available courseware). Many types of questions supported (multiple choice, multiple response, true/false, fill-in-the-blank, surveys). Questions and exams are highly customizable (pictures, backgrounds, fonts, rules, question groups). Reports and analysis based on real-life student answers. Exam workflow can be customized (timers, randomized questions/distracters, answering sequence, reporting). The Scheduling System is a training and resource scheduling tool specifically targeted for the aviation industry. The system is used to streamline scheduling processes, support internal business workflow, and efficiently track and utilize resources. Organizations can implement and schedule entire training footprints and curriculum including e-learning, classroom and simulation events, as well as assessment and testing. It is configurable to accommodate various types of scheduling and resource planning requirements including classrooms, FTDs, simulators, and meetings. The system allows you to create inventory, dynamically set up roles and permissions, and integrate with other systems via API. The Learning Content Management System (LCMS) is an integrated, distributed development environment to facilitate the development and management of courseware. The LCMS enforces content development process and best practices, provides a collaborative environment for the instructional designers, the subject matter experts, the developers and the customer. 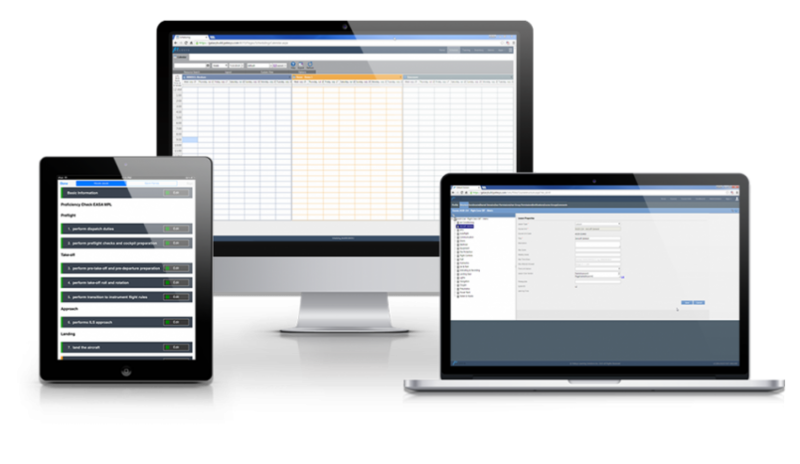 The LCMS provides efficient tracking, versioning, reporting, and management functionalities. Its embedded HTML editor allows you to create animations with no programming knowledge and package courses that meet AICC and SCORM standards. Need courseware? Browse our aircraft type course and special operations courseware library. The Scheduling System is a state-of-the-art, web-based, training and resource scheduling tool specifically targeted for the aviation industry. The system is used to streamline scheduling processes, support internal business workflow, and efficiently track and utilize resources. The Qualification Management System (QMS) is a web-based, online management solution that is used to monitor, aggregate, and maintain employee qualifications. The Electronic Training Records solution (ETR) and Mobile Assessment tool allows you to collect training and assessment data online as well as offline, store it securely and analyze the collected data. With the ETR solution you are able to extract precise statistical evidence to adjust and fine tune your training programs and improve your instructor standardization. Designed for the needs of the aviation industry, the LMS is fully compliant with AICC and SCORM standards, and supports industry standard desktop and mobile platforms. With the LMS, trainers can implement entire training footprints including e-learning, classroom and simulation events, as well as assessment and testing. The Exam Generation System (EGS) is a web-based question management and exam generation tool that provides a centralized platform to manage question databases and create electronic exams, quizzes, assessments and surveys. Exam structures can be created that meet examination requirements, such as random question generation, random question order, random distracters, time limitation, re-entry restriction, mastery scoring and will meet regulatory authorities examination and System Knowledge Validation (SKV) requirements. A representative from Sun Life Financial has come by and collected all our group health enrollment forms on Tuesday. Those forms are part of our group health application approval process requirements. A representative from Sun Life Financial has come by and collected all our group health enrollment forms on Tuesday. The Learning Content Management System (LCMS) is an integrated, distributed development environment to facilitate the development and management of courseware. The LCMS enforces the development process and best practices, provides a collaborative environment for the instructional designers, the subject matter experts, the developers and the customer. Pelesys’ Training Management and Deployment System (TMDS) encompasses scheduling, learning management, learning content management modules, examinations, qualifications management, and electronic training records and grading. The TMDS solution is a state-of-the-art SaaS (Software as a Service) system, which is scalable and flexible for any airline or training operation. A tailored system configuration will be created based on each organization’s requirements and needs. The solution supports industry standard desktop and mobile platforms, online and offline. TMDS manages all aspects of training from qualifications, notifications, curriculum / content development and deployment, classroom and simulator scheduling, electronic grading and reporting. It enables an organization to schedule and deliver their training efficiently while ensuring regulatory compliance, reducing operating costs and introducing automation to existing work processes. The Scheduling System is a training and resource scheduling tool specifically targeted for the aviation industry. The system is used to streamline scheduling processes, support internal business workflow, and efficiently track and utilize resources. Organizations can implement and schedule entire training footprints and curriculum including e-learning, classroom and simulation events, as well as assessment and testing. It is configurable to accommodate various types of scheduling and resource planning requirements including classrooms, FTDs, simulators, and meetings. The system allows you to create inventory, dynamically set up roles and permissions, and integrate with other systems via API. The Qualification Management System (QMS) that is used to monitor, aggregate, and maintain employee qualifications. QMS is a rule based solution that will automate the management process to track all your qualification requirements for flight crews, maintenance engineering, dispatchers, ramp employees or any other business unit that requires qualification monitoring for regulatory compliance management. The QMS is an invaluable aid for employers seeking to streamline their qualification process and ensure that employee qualifications remain current. The Electronic Training Records solution (ETR) and Mobile Assessment tool allows you to create and manage any type of task analysis or assessment criteria, then generate electronic grade forms and assessments that can be completed online or offline. Completed assessments are stored securely, so that collected data can be analyzed and reported on. With the ETR solution you are able to extract precise statistical evidence to adjust and fine tune your training programs and improve your instructor standardization. The ETR solution enables you to streamline your training data management process, efficiently manage your AQP / ATQP or other EBT (Evidence Based Training) programs and reduce your overall training management costs. Traditional assessments such as Line Checks, CRM Forms, Type Rating Assessments and Proficiency Checks can be easily managed and delivered using ETR. *The ETR System is developed in partnership with Logitude Ltd. The Learning Management System (LMS) organizes, launches and tracks e-learning content. It allows an organization to effectively manage user records, enrollments and learning status records to improve operational and training efficiency. The LMS is compliant with AICC and SCORM standards, and supports industry standard desktop and mobile platforms. Pelesys LMS supports mobile training, distributing all types of training content and media to mobile devices for off-line training. Flexible online / offline record synchronization allows the user to take the same course(s) online over the Internet as well as offline from an iPad, USB, or PC or Mac computer. The Learning Content Management System (LCMS) is an integrated, distributed development environment to facilitate the development and management of courseware. The LCMS enforces content development process and best practices, provides a collaborative environment for the instructional designers, the subject matter experts, the developers and the customer. The LCMS provides efficient tracking, versioning, reporting, and management functionalities. Its embedded HTML editor allows you to create animations with no programming knowledge and package courses that meet AICC and SCORM standards.